The event which saw the announcement of the new Xiaomi MI A1 was held in Delhi last night. The phone has an identical design to the MI 5X, which is powered by stock Android 7.1.2. It comes with Snapdragon 625 Octa Core Chipset, built on 4nm process. It also come with 4G RAM+ 64G ROM, display spots 5.5” Full HD resolution. Coming to the back of the MI A1, it houses dual camera setup similar to MI 6 with Dual LED (dual tone) flash. You also find the fingerprint identification secured below the camera. The phone has been placed on google collections of affordable phones for coming up market. Under the film body of the A1 is 3080mAh massive battery, which uses type-C USB cable for charging. The A1, being a stock Android means that Xiaomi has launched the A1 without MIUI 9, but the MIUI camera app is intact for the phone. The phone came promising that its OS will be updated to Oreo by the year end. 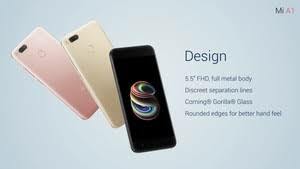 Xiaomi A1 will be the first phone by next year to feature Android P.
New Xiaomi Mi A1, which has been successful announced comes in colors of black, pink and Gold, and will be made available in 37 countries for a price between of 200$. Sales for the phone is expected to kick off from September 12.